In which we fall, and fall harder. The beauty of the Socktopus beginner spinning course is that in spreading it out over two Sundays with a week or two in between, you get to practice and get to grips with drafting and spindling and the whole rub-your-tummy-pat-your-head scenario. I’m glad I practiced as much as I did because today was when the simple, meditative action of spindle spinning blue faced leicester or merino, kicked up a notch. There were wheels and there was fibre. We did do a little bit of spindle spinning our existing fibre to start the day off and warm up the fingers and brains but then, there were wheels, both Ashford Joys. Pretty much as soon as I gently pressed down on the treadle I knew I was sunk. It took a little while to get used to drafting in time with the twist, and it took several shufflings before I got the wheel and my chair far enough apart that my lanky legs didn’t get in the way – it’s like reaching for the pedals on a car- but by the end of each of my turn on the wheels I was spinning yarn that I was happy with, thin-ish, and not too overtwisted. I’m hoping that I can hold out until Christmas to save up for a wheel but Christmas may have to come early. I really liked the Joy but I will aim to try a few wheels just to see. I love the look of the Schacht Ladybug but it is significantly more expensive than the Joy and if it’s just a red wheel with a little ladybug it may not be worth the extra funds. If you have any recommendations for something that you think that I must try then please let me know. Diane also showed us her spindle lazy kate and a brilliant way to transfer yarn from the spindle without asking your husband to sit and hold a revolving spindle for half an hour by sliding it onto a drinking straw and then using it on a lazy kate. Either we are going to have to get one or H is going to have to make one. I know this because he gave me a ballwinder and swift shortly after I started needing him to spread the yarn to wind skeins. A lazy kate is technically a gadget so that passes muster with the man of the house. And more mohair. 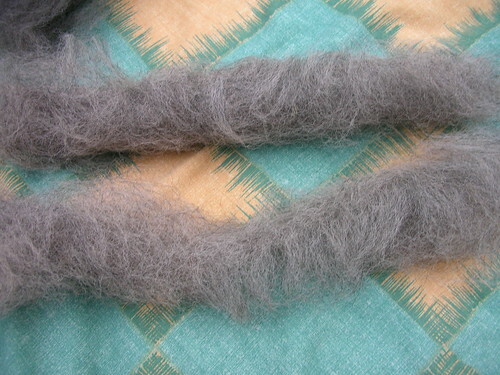 My associations with mohair are that it is soft and fluffy but this is hard and a thick fibre. 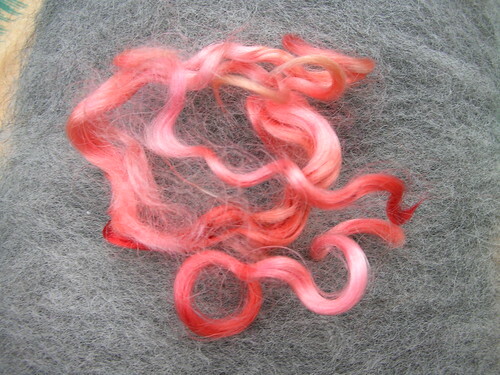 Diane had some pure mohair spun up and it is very crunchy and not something you would want next to your skin. Kid Silk Haze is clearly a product of the alchemist rather than the spinning mills. This is Wensleydale ( I think). 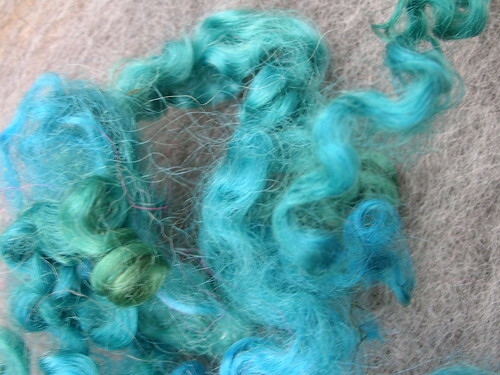 It is much coarser to touch than the merino of BFL and is very very curly. 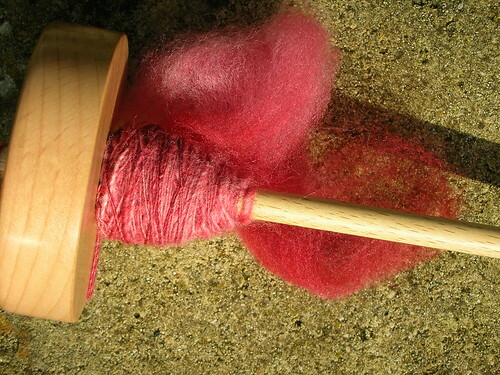 I think it would need a bit more carding before spinning. 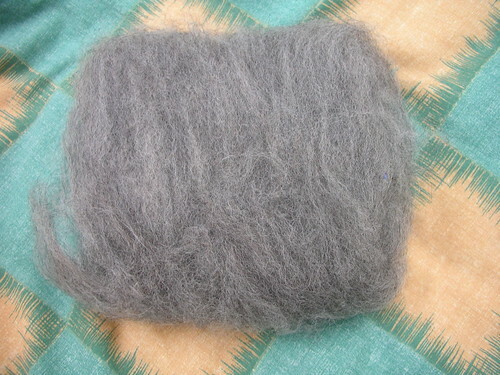 This is Corridale, coarser than BFL and merino and described as a pot scrubber by one of our number. 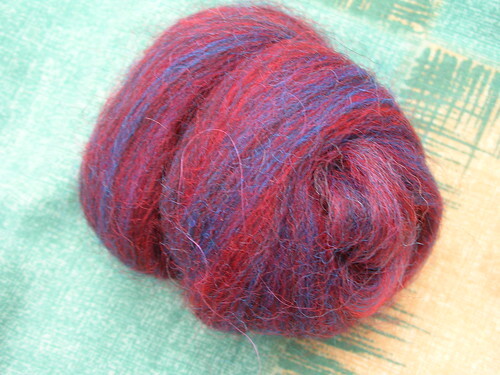 It does have lovely long fibres though and should spin up nicely. Doesn’t it look like a Jackson Pollock painting? I had some locks as well which I carded on the hand cards into these two rolls – the top one is the second one and the better one! 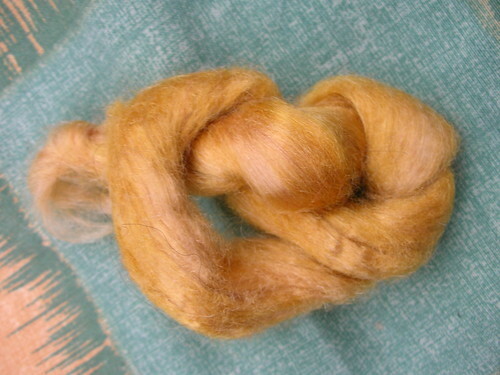 It’s a different sort of preparation for spinning because the fibres are all parallel to each other here, rather than leading into each other as in combed top. I know that this makes the difference as to whether I’m spinning worsted or woolen but I can’t remember which one’s which. Whichever it is, this should make big fluffy yarn. What, you don’t see it? Alas I left my fluffy angel cloud on the side of Alice’s sofa and forgot to pick it up to bring home. I’m going to have to find some more at some point though! 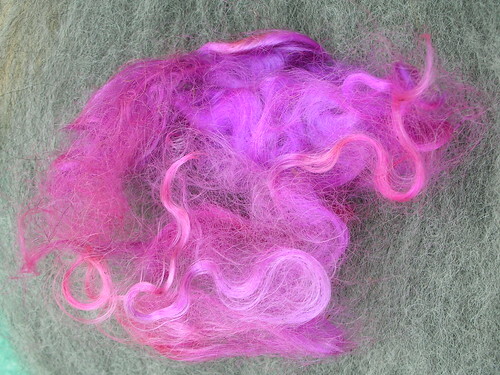 And the reason why none of these fibres are on my spindle at the moment? It’s been a little occupied! All in all it’s been a great day and I highly recommend the Socktopus classes if you fancy learning to spin. 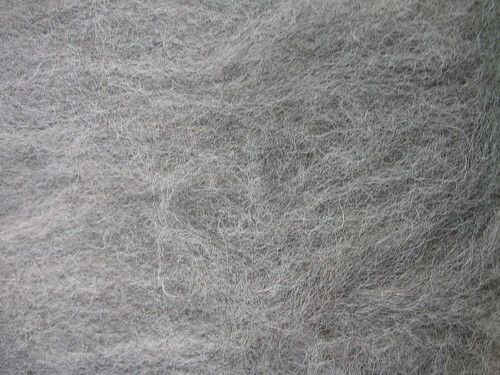 My essay for today… KSH is kid mohair, baby goats are soft and fluffy but you only get baby fleece once so it’s dearer. You can buy kid roving as well as adult (never seen yearling roving tho). I have a Sonata and I love it, it might not do for you. You need to think about what you are likely to spin and the ratios that you’d need to make that easy, whether you’d want a big skein so need a jumbo flyer, whether you’d like a wheel that folds so you can stow it away (and take it on holiday). If you google “spinning wheel reviews” you might get a few ideas. If you can you do need to try before you buy, it’s the little things like whether your feet fall off the treadle(s) that make the difference. I’m so glad you mentioned it was your Polwarth – we didn’t know whose it was!